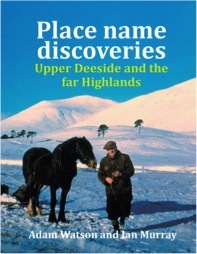 The Latest in the Series - "Place name discoveries - Upper Deeside and the far Highlands" by Adam Watson and Ian Murray. Adam Watson continues to write enthusiastically and this is a review of his latest book. It is very much a sequel to "The place names of Upper Deeside" by Adam Watson and Elizabeth Allan (1984) and a companion to "Place names in much of north-east Scotland" by Adam Watson (2013), reviewed in Mountain Views Issue No.69. My review of Adam's recent book will be taken as the starting point for this review. As before, the most important aspect of this book is that it helps to preserve local place names that are steadily getting lost as names get anglicised and in-comers move in. This is getting steadily more important as locals increasingly emigrate and other people immigrate, even into what are typically regarded as 'local' jobs such as gamekeeping and stalking. The speed of this change is almost frightening, e.g. check out the deterioration in Gaelic speaking in Skye over the last twenty years! However, the book will appeal to more people than just historians. It inevitably has long lists of names and explanations. These can be rather indigestible, but there are two key differences. The text contains far more information on how the names were collected and it is accompanied by a good selection of excellent photographs. To a novice, like me, information on how the names were collected is more interesting than the names themselves. It brings the whole thing into life and almost makes it tangible. Comments on estate papers and the need to focus on pronunciation as this will be lost first are revealing. It's interesting to learn of the help that Adam and Ian have encountered; people want their culture to be recorded and to not just disappear in a wave of so-called progress. It's worth buying the book for the photographs alone. There are some absolute gems. One or two, you will have seen before in others of Adam's books but these repeats, e.g. the title photograph of Bob Scott leaving with Punchie to get supplies in the winter, are delightful and more than worth a second look. I found that I was reaching for the earlier books to find the original or a companion, refresh my memory and see the accompanying photographs. Many of these classic photographs show the older local people with the countryside etched into their faces. These are people who have had a deep and instinctive connection with the local countryside. A connection that you can only envy. Others show both local landmarks and landscapes. The landmarks evoke further nostalgia - memories of a bothy or shelter looming up out of the low cloud to give that reassurance that you are on the right track after all. As with the previous book, this is not a book for reading but for dipping into before or after a trip into the hills. It is an essential mark of respect to take the trouble to try and pronounce the local names correctly. I conclude by wholeheartedly recommending it.